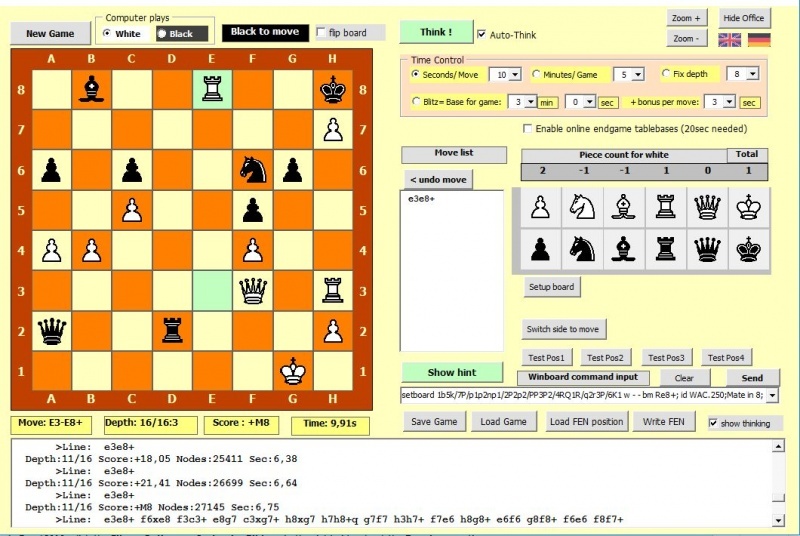 an open source chess engine by Roger Zuehlsdorf, written in Visual Basic to run under 32-bit Windows, first announced and released in September 2015 . The common source subset could either compiled using Visual Basic 6.0 to create a WinBoard compliant executable - or, albeit about 15 times slower, may be interpreted by Visual Basic for Applications to run under Microsoft Office applications, that is Word, Excel, or PowerPoint, along with an own GUI based on Windows Forms. ChessBrainVB was initially based on the source code of LarsenVB by Luca Dormio, which in turn was inspired by the C program Faile 0.6 by Adrien M. Regimbald. Still using the 10x12 mailbox board representation, ChessBrainVB's search  and evaluation subsequently improved influenced by ideas from open source programs such as CuckooChess, Sjeng, Protector and Stockfish combined with own ideas . This page was last edited on 17 August 2018, at 14:44.